When I decided I wanted to write something about World Mental Health Day, I had planned to write something truly inspirational to help others. Unfortunately the time to do that didn’t transpire. As it never bloody seems to do when I want to be extra creative. But that’s okay. Stay with me. I want to talk about why we shouldn’t talk about ‘mental health problems’ today. Just a few weeks ago, I became a qualified Mental Health First Aider. I didn’t expect my view of the world and mental health would change very much. 75 per cent of mental ill health starts before the age of 18. 75 per cent of people with mental ill health receive no treatment/diagnosis at all. There are more suicides than road traffic accidents in this country yet we only tend to hear about the latter. As I walked out of that training room, I realised there was something much bigger, scarier and more harmful then all the rubbish about Brexit and international tensions. It was much closer to home and far more likely to make my life complicated…. Mental health. It has life-changing consequences throughout our lives and those of our children and work colleagues, whether we want it to or not. have a cold coming on so I work on it everyday. But I didn’t know what I was experiencing was classed as a ‘mental health problem’ for at least 7-8 years. I didn’t know it was a ‘mental health problem’ that caused my jaw to lock suddenly & my cheek muscle to lock in spasm for at least four months on that dreary February day. I didn’t know it would land me with a chronic jaw & neck problem I’m still being treated for three years on. 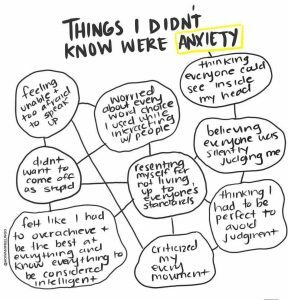 And if I didn’t know then, that means there’s millions of other people experiencing similar symptoms that don’t know right now. I’m now realising more and more that one of the reasons has to be down to the language we’re still using. ‘Mind your language’ is what the people at Time to Change say in this helpful post for anyone writing about mental health. People on the whole have limited understanding around mental health. The stigma and stats all say so and that’s why we have mental health awareness days and MHFA First Aiders. Not enough research and investment has been made yet so it’s completely understandable why it doesn’t turn on warning lights for many of us like a broken leg or a lump in the breast would. 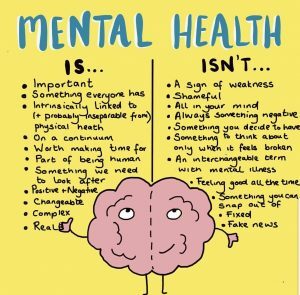 Even ‘mental health problem’ is the wrong term in my opinion. That’s because as humans, we’re busy, we don’t like problems. They’re vague. Too unknown. We don’t say it for physical health issues either. We don’t say ’if you’re experiencing leg problems’. We don’t say ‘worried about your head issues’. It’s not a problem, it’s an illness or injury. Illnesses have symptoms or indications that show they’re there. An illness is something that can be diagnosed and treated. An illness left untreated could lead to more serious complications, even death and potential repercussions for generations to come. What if we don’t change our language at all…potato, potata and all that…and something magical just happens? Try telling that to the wife whose “happy-go-lucky” husband attempted suicide last Friday. Try suggesting it to the guy who just lost his job because he had panic attacks that made him late or absent for work. Try offering that as an excuse to the youngster who can’t understand why she self harms every Sunday night before school. All forms of healthcare are bloody complex. I get it. I don’t have all the answers and I’m not a doctor or pretend to be. But I am a patient. I am a mum, a daughter, a sister and a friend. I’m on the end of whatever health organisations have to tell me about my mental health. And I have it just like you. But we’re still not there yet when it comes to breaking down the stigma and getting the language right. I know we’ll never get it 100% right. The world changes, people can choose and we all come from different backgrounds and cultures. Don’t even get me started on health budgets. But I’d love to live in a world where healthcare organisations and the media would just talk about mental health more accurately and respectfully. I think this would remove the stigma and make it easier for people to understand the difference between everyday pressures and something worse. 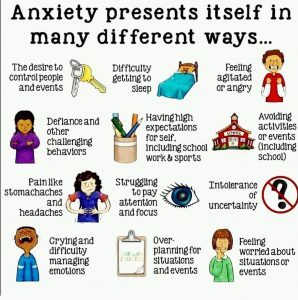 Talking about the symptoms, and what people can hear and see instead of wooly problems, can show mental ill health as perfectly normal and nearly always treatable, just like a physical illness. And if we can make it clearer for kids to see what’s normal and what’s not whilst they’re still young and developing, surely that will bring massive physical and mental benefits for them in later life? And make access to mental health services quicker for all? And save money for the NHS? At the end of the day, I just want my kids to be happy, healthy and trust who to turn to when they’re not. Don’t you?